The Olive Upright is found on just about every river in Britain, and it is probably the most abundant spring fly of all. 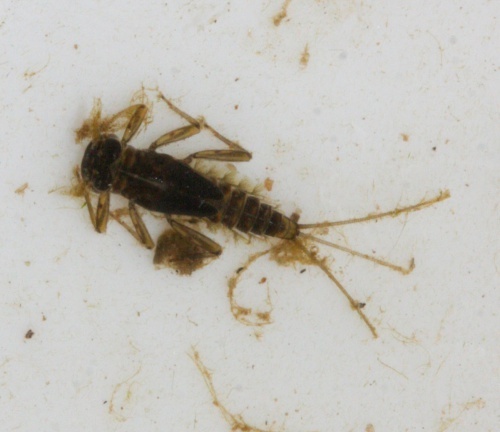 The nymphs are flattened stone clingers and are found in all kinds of running water, including chalk streams and spate rivers. The dun hatches throughout the day from May until July. Hatches are often heaviest towards evening, and at that time the spinners also appear, but their egg laying occurs very late in the day so that the duns are usually far more important as far as trout fishers are concerned. Similar to its close relative of Rhithrogena germanica the larvae being almost indistinguishable. However Rhithrogena germanica larvae hatch earlier and if you find a mature larva in late spring it is almost certainly Rhithrogena semicolorata. Nymphs of Rhithrogena semicolorata live chiefly in the riffle sections of rivers and are usually found clinging to submerged plants and stones, although they may swim if disturbed. There is one generation per year that overwinters as nymphs. As growth rates vary with water temperature, the period over which adults emerge is variable, but adults have been found between April and September in the British Isles. Nymphs feed either by scraping periphyton from the substrate or by gathering fine particulate organic detritus from the sediment. Widespread and fairly frequent in Britain, particularly in the north and west.